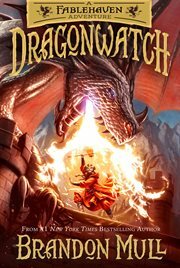 The item Dragonwatch, Brandon Mull, (ebook) represents a specific, individual, material embodiment of a distinct intellectual or artistic creation found in Charlotte Mecklenburg Library. In the long-awaited sequel to Fablehaven, the dragons who have been kept at the dragon sanctuaries no longer consider them safe havens, but prisons and they want their freedom. The dragons are no longer our allies.... In the hidden dragon sanctuary of Wyrmroost, Celebrant the Just, King of the Dragons, plots his revenge. He has long seen the sanctuaries as prisons, and he wants nothing more than to overthrow his captors and return the world to the Age of Dragons, when he and his kind ruled and reigned without borders. The time has come to break free and reclaim his power. No one person is capable of stopping Celebrant and his dragon horde. It will take the ancient order of Dragonwatch to gather again if there is any chance of saving the world from destruction. In ancient times, Dragonwatch was a group of wizards, enchantresses, dragon slayers, and others who originally confined the majority of dragons into sanctuaries. But nearly all of the original Dragonwatch members are gone, and so the wizard Agad reaches out to Grandpa Sorenson for help. As Kendra and Seth confront this new danger, they must draw upon all their skills, talents, and knowledge as only they have the ability to function together as a powerful dragon tamer. Together they must battle against forces with superior supernatural powers and breathtaking magical abilities. How will the epic dragon showdown end? Will dragons overthrow humans and change the world as we know it?